I had a BLAST making this card. I started with the Verve challenge going on right now but realized that it worked for several other challenges! Scroll down to see the other card I made for those challenges as well. 9 challenges in two posts, that is a record! Wahoo! The Verve challenge was to combine the styles of two of their DT members, Jen, who is known for her colouring and Janelle, who is known to have a paint brush in one hand and a Copic in the other. So combining those two styles is the goal but if you really want to make it challenging, add Jen’s love of kraft paper and Janelle’s love of mixed media. Since I’ve been trying to add more mixed media to my work, I decided this was a challenge made for me. 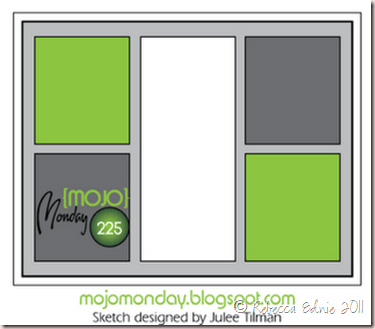 Especially since I won a Mojo Monday recently and had some brand spankin’ new Verve stamps to try out! And some new mists and masks… Yeah! I started by getting out my new Mister Huey’s mists but then I made the wise decision to cut some tags and test spray the mists. Sooo glad I did because they are so NOT the colours on the label! Then I sprayed the background on my card base. Next time I will use some adhesive because the paper curls when the first few spritzes hit it but the mask doesn’t. I allowed it to dry while I prepared my tag. When I die cut the corrugated cardboard, the bumps got all squished so I lifted them back up with my bone folder. Then I applied two colours of paint, the turquoise you can see easily and a gold glimmer paint that is harder to see, along the edges. Then I added the sand and shell bits and while still wet I added some glitter. The rest is pretty easy to figure out. I’m entering this in the following challenges. Simon Says Stamp: Transport. I know a surfboard is a bit of a stretch but lifeguards use them to get to swimmers in danger so I figure that makes it count! I’d recently finished a bottle of supplements and noticed that , for once, I had a nice bottle with a nice metal lid without any weird colours or writing on it! Yeah, can you say embellishing opportunity! And then when I saw this week’s WMS sketch, I knew it would be perfect! The sketch lent itself, I thought, to having a tag as the focal panel. I made the tiny little flower with a Cheery Lynn Cuties die, sorry, I don’t remember which one. I decided not to do any distressing because I don’t know the recipient very well. This is for my future brother-in-law’s mother! I know there are a few people out there who think distressing looks dirty and I wouldn’t want her to think I make junk! I think I’ll fill it with some chocolates to accompany the thank you card I’m making for having an engagement party for my sister. My family doesn’t know his family so it was the first opportunity for us to meet them all and his is a BIG family as he is one of 7 kids and they are all older with their own families! I am very pleased with the result. I love altering and decorating pretty found items and I feel so green doing so! Click on the sketch to link to the challenge. THIS A SPOILER ALERT! 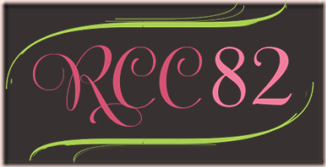 REBECCA, DO NOT READ THIS POST! I am going to type everything at the top of this post so my BFF Rebecca (yeah, same name, I know!) doesn’t see it before she closes this page. 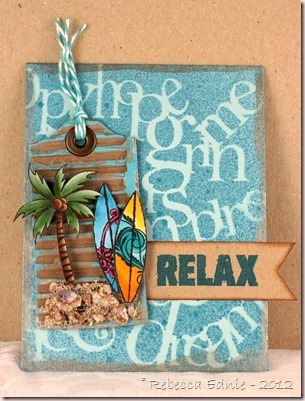 This card uses the Mojo sketch for this week and also meets the requirements for this week’s PTI Make It Monday to make a shaker card using dies. I hadn’t thought to use dies before and I really had a fun time with it. I think this also qualifies for the JustRite colour challenge if I still have time to enter. ETA Darn, missed it, again!!! I used Labels 1 Nesties for the outer frame and PTI’s heart die for the inside. I had a sheet of foam dimensional material that I cut instead of fun foam. The acetate sheet comes from stamp packaging. Way to recycle right? Hopefully this is down far enough on the page that she won’t see it! Isn’t that ice cream paper the cutest?? I made the heart button with another PTI heart die. 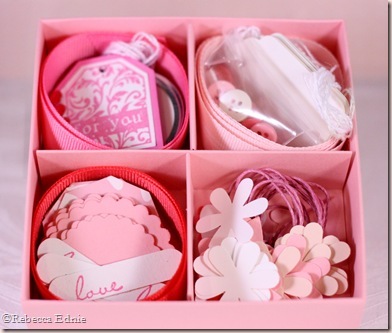 The little words inside the shaker box are from Mega Mixed Messages and I hand cut them. Also in the box is clear micro beads and some glitter, a mix of white and gold I think, I bought it like that. The bear is paper pieced and shaded with Copic markers. Actually, I though the paper needed muting so I coloured the whole image with E71. My girlfriends threw me the best Teddy Bear themed baby shower in honour of my new baby, Theodore, Teddy for short. I love it! Rebecca even bought honey bears for everyone and HANDCUT 30 or 40 bear shaped tags! WOW! So the shaker words say ‘wish’, ‘friend’, ‘merci’ and ‘thanks’. I took a photo of how I layered the shaker box so if you’d like to see, just let me know. What an awesome set for guys! Perfect for the outdoorsy type! We all know bows and flowers won’t work for the men in our lives. This is part two. 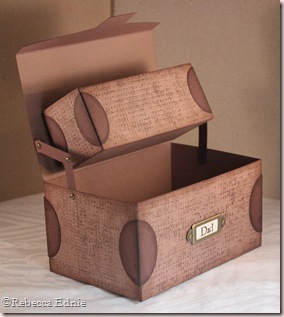 I used the tool box template from My Time Made Easy to make this great gift box. 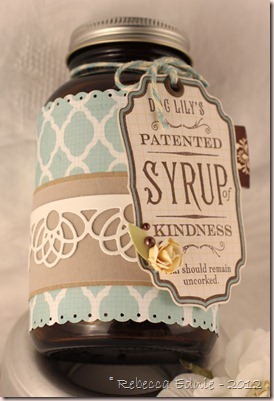 Inside is an instant coffee jar repurposed with a covered lid with trail mix inside. I meant to add some other stuff but I didn’t get it done in time. 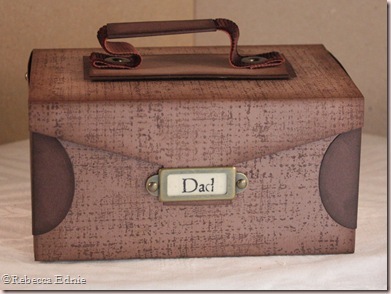 And even though it doesn’t include the images from this stamp set..
…a drawer inside! I was going to put gummy worms and candy bugs inside but hubby forgot to buy them on his trip to the store. Bummer! 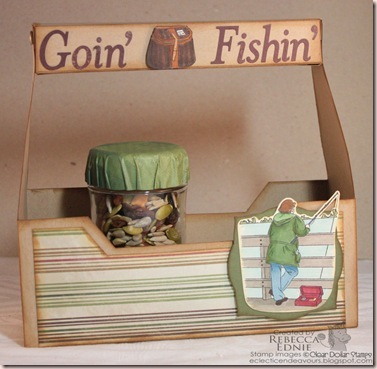 I figure between the tool box and the tackle box you could package so many things for the guys in your life. Both boxes are large enough for a tie (of course!) bath and body products, jewellery, snacks, baked goods or candy, fishing items (not that I know what they are called beyond weights or lures) and CDs or movies would fit in the tool box! I hope you are inspired to make something great for the guys in your life! Today is the last day for the reveal by Clear Dollar Stamps for June! But there are more posts coming up for two other great guy stamps, so don’t miss them! 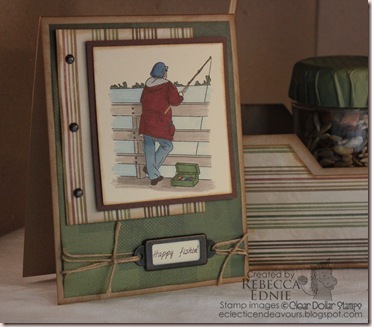 Be sure to visit Clearly iStamp to see the other team members who are revealing this stamp set on their blogs and to see the full set! Ink: Memento black, Antique Linen and Vintage photo Distress inks, chocolate chip-SU! Ink: Antique Linen Distress, cocoa, choc chip-SU! Paper: cocoa, choc chip, ivory CS-SU! I HAD to make these for my craft show; I was so inspired by the kits that Mish of Mish Mash makes and the divided tag box from SCS. 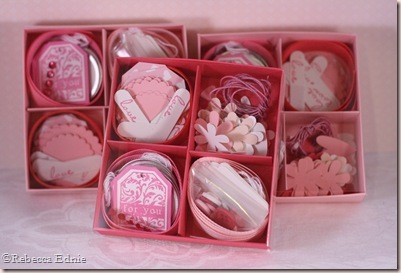 Inside are all kinds of heart and flower punchies in 5 colours, tags, twine, ribbon, rhinestones, buttons and brads. There are over 115 pieces in each box. I figure it is enough for at least 25 mini cards. Isn’t the box cute too? I really enjoyed making them. Here are several of them together with the clear slide-over lids on. BTW, I really like Melon Mambo. I bought it because I was low on the other pinks from the Bold Brights package and keep them in stock for doing kids classes for young girls. Melon is so much prettier than the others. I am definitely going to buy the matching ink, ribbon and more paper. 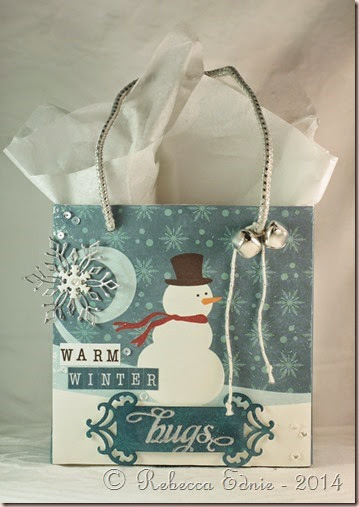 This is a great gift for any young lady along with pre-folded mini note cards. 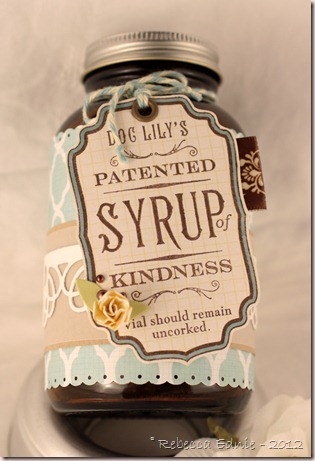 These can also be used for scrapping for kids or kids-at-heart! 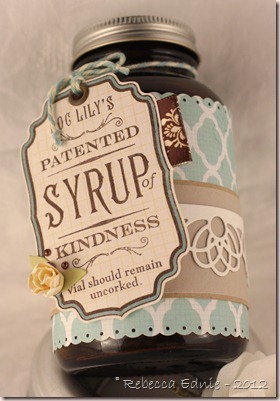 And what a FANTASTIC way to use up your scraps. I made all 4 of these with nothing but scraps except for the boxes of course. Way to go green!! BLOG CANDY ANNOUNCEMENTS The winner of the ribbon challenge was my local gal pal Janet. The winner of the comment challenge was Kathy S. Thanks to all who played. Accessories: pink hemp twine-Hemptique, pink pirouette striped ribbon-SU!, other ribbon-stash, rhinestones-Zva, brads-Taylored Expressions, buttons-PTI and stash, tags-Staples, various heart, flower and tag punches-SU! and EK Success, word window punch-SU! THIS IS THE SECOND POST FOR TODAY, BE SURE TO SCROLL DOWN. 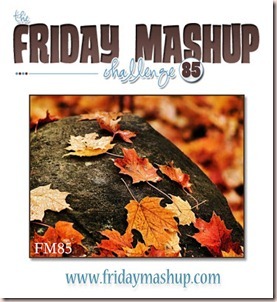 This week, Madelynn gave us an inspiration challenge. What a beautiful and tasty photo! I only have one citrus stamp and I didn’t feel like using it. I need to use Bold Brights ink for most citrus fruits and I just wasn’t in a BB mood. So I opted for another fruit. PEACHES. 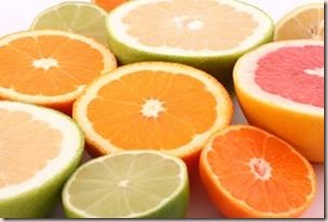 My favourite fruit, well maybe along with raspberries. The two together mixed with frozen yogurt is AWESOME! This tag came together quite quickly! AND I used all scraps! WOOHOO! The tag was cut with a Coluzzle template, it was a bit too tall for my scrap so I shimmied it up part way through the cutting to make it shorter. 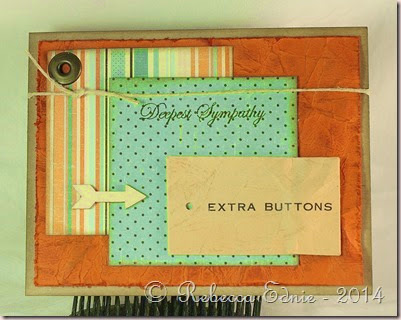 I stamped the image with Stazon brown on confetti vanilla and then again with apricot ink and again with olive ink. I cut out the peach and leaves and layered them on the main image. I added a bit of shading with pumpkin and regal rose markers. As always, be sure to play along with us! Make a card or other project using the photo to inspire you and upload to SCS or PCP using MTTSC29 or post to your blog. 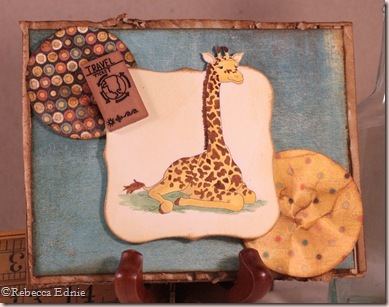 Be sure to link up to Madelynn’s Twinkling Tuesdays so we can all see your creations. Visit all the team members blogs to see their work and we all love reading your sweet comments so be sure to leave some love! 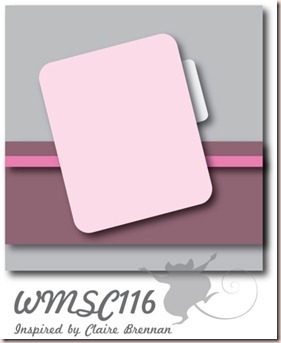 Stamps: peach label image and canvas-SU! 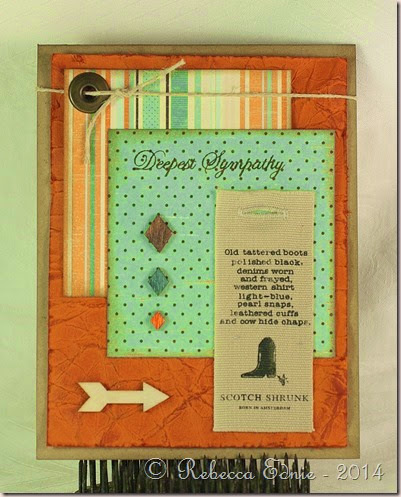 Accessories: button-stash, hemp twine-Hemptique, twill tape-stash, Coluzzle template, foam dots-Jody Morrow, ribbon-Masterstroke, celery, pumpkin, regal rose markers-SU!